In 1963 a new factory opened on Denton Island. It was originally called Ferguson Radio Corporation, then British Radio Corporation, then Thorn Consumer Electronics and finally J2T Video. It closed in 1988. It was always the same Company but the name changed to reflect the products being made. I worked there for 25 years. 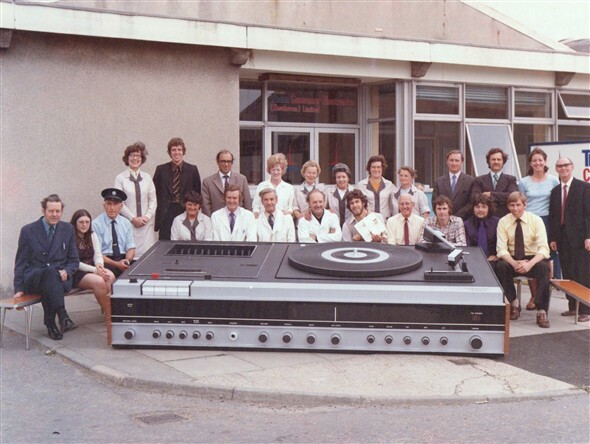 The picture below was taken around the mid 70's and is obviously a Music Centre which is an exact copy of the largest selling product of it's day although made completely out of wood ! It was made so we could enter the Newhaven Carnival. The man responsible for building it was Keith Nicks who is seated fifth from the left. He was a very skillful cabinet maker and jig maker who worked for the Company for most of his life. Many 'locals' will know Keith who transferred from Newhaven Cabinets in the Drove. Front row left to right: Joe Blackman,Jean Tapp,Tom Martin,?,Keith Nicks,?,Jim Elliott,Colin Clarke (holding the plug),Jimmy James,?,Dave Deakin,Paul Blackman. Standing left to right: ?,Dave Corver,Ken Self,?,?,?,?,?,Mike Foster,Ian Everdell,?,Albert Martin. This page was added by Paul Blackman on 10/04/2009. And they were good value-for-money music centres in their day too. I owned one of the same model for about 6 months. It must have been good because a burglar took it away one night. I woke up in the morning and it was gone. My sister also worked there during the 60s. Her name was Colleen Roche and she bought one of the Ferguson Radios which I believe travelled with her belongings when she emigrated to Australia in 1968. Has anyone earlier photos of the factory? I am looking for a photo of my father who was from Barbados in about 1961. Noting your request Andrew, I was at the factory from it's opening in 1963 so do you mean you would like to see photo's from that time onward. I do remember a lady who worked there at the same time as me, her name was Phyllis Wiltshire, I think she lived in Newhaven, maybe up the Mount, she was a Supervisor on one of the Production Lines. Any relation ? I well remember leaving the factory early each morning around 4am to do the London run in one of the two Newby's lorries that were contracted to Ferguson's or Thorn's. Often had trouble trying to pass parked cars beside the Bridge Hotel. I remember one morning I gave up and tried the river wall route along past the back of the Co-op and the RNVR Base and coming out by the swing bridge. Only tried it the once as there wasn't much room along there and being on ones own, in the dark, it was a slow drive I can tell you. Thought for sure I was going to end up in the river. I used to do the run to Abridge in Essex and then sometimes onto Southend for Cabinets, or the other way to Enfield for components. Great bunch of guy's worked at the factory dispatch and receiving dock. Can't remember the names but can still see the faces. Happy Day's. Hello Paul. Good to see pictures of You and Joe on Denton Island are there any pictures of Walser and Turner Plumbers on the Riverside ? I can just remember when Dad ( Oscar ) had a handcart and then progressed to a three wheeled van for his plumbing works with Ben Turner ( my Uncle ). Hi Steve, great that we've got back in touch after all these years. Have left message for you on 'Message Board' page. I wonder if anyone on the technical side can help with my ongoing research into the British tape recorder industry, particularly Thorn Industries (see Brenelltape.co.uk)? Would you please contact me on bjrustic@aol.com Thanks. Hi Paul, I worked here as well in the 70's. Does anyone remember Mark and Jenny Giles or Ginger Sue? Please let me know. Hi Chris. Yes I remember all 3 of those you mentioned. I am still in touch with Mark. I was at J2T for about six years from 1982. I would guess that most of Newhaven and surrounding area put in time at Thorn/J2T, Concord or Parker. I worked at the factory from 1970 until about 1978. On the production line as an apprentice and then in the Test Gear Lab with Dave HUNT, Chris TIDY, George WHITE etc. I expect you would all remember my dad Reg Laycock. He has a lot of health problems now but still sharp as a knife; when he annoys mum she always says "OK OK you're not in the factory now". I know he has great memories of the place. I worked there for nine months as part of my degree industrial placement - with Paul, Chris, Alan Godsmark (DoB), all led by Neville Chapman. I remember staying at Mrs. Friend's guesthouse in Seaford (25p per night including breakfast and evening meal). Jim Elliot used to give me a lift to Brighton Station on Friday nights to travel back home to London.The unidentified girl in the light blue top on the right is Jennie Froud from personnel ("educated Jen" to some). She is now Jennie Terry - we got married in 1979 and are both retired and living in Somerset. Jennie recognises the woman fourth from the left as the person who ran a very good canteen - but can't remember her name. We were told about this website by a student predecessor, Andy Taylor. Hi Guys. I worked at the Newhaven Cabinet Company on the Drove,as a apprentice from 1961 to 1963 in the mill dept. Just wondered if anyone has a photo or two of the factory from back then, and also if there are any former workers still about from that time. It was my first job after leaving school, and was a very friendly place to work at. I know most of the cabinets that were made there went to Denton Island. Thanks . I was an apprentice from 1972-76 and worked in the test gear lab with Chris Tidy, George White, Dave Brooks and others, all under the caring mentorship of the boss, Dave Hunt. I wonder where they all are now? Message for Jean Cutmore. Yes Jean I am well and retired now. One thing I need to ask. Is your brother Alan still OK. I was best man at his wedding to Pat but have lost contact with him and haven't seen him for some 40 years or so. Hope you are well. My dad John Wellfare worked throughout each of the different companies, I still have his reel tape to tape player and record player (both Ferguson) and both still fully working. I went there many a time when I was growing up and learnt my electronics there too. Hi Christina I remember your dad Reg, my dad John Wellfare and him worked for years together.... I worked with Reg afterwards for a couple of years... so glad to hear his still doing ok and such a wonderful man. Just a small piece of information ........Keith Knicks, who is in the above photo was responsible for making the 'Giant Music Centre' pictured, sadly passed away last December. Although originally from Brighton Keith worked in Newaven all his working life starting at 'Champions Cabinets' in the Drove and then moved to Fergusons on Denton Island where I worked with him for 25 years. He then went to 'Bevan Funnell' when the factory closed on the Island and then retired. A real craftsman, a gentleman and a good friend. Hi Paul. I am glad you are well. I am good thank you, unfortunately not retired however. Joan is really good too (82 now) I still can't walk past your parents place on Brighton Road without thinking about them. Happy days. Yes I saw Alan and Pat last week they both are really well and still living in the same house up the Mount. Hi Again Jean, Thanks for your response and please give my best wishes to Joan. Thanks also for the memory of passing Mum and Dad's house in Brighton Road. Pleased to hear Alan and Pat are well although unfortunately I know they live 'up the mount'. I don't know exactly where they live but I will try to find out because I would like to see them again. Just to say that I remember Tony Gray above and worked with him in the Test Gear Lab. I have been retired for nearly ten years now and am living in France. Interesting to hear Richard! I tracked down Dave Brookes recently - he's working in California for Dolby Labs. So from small beginnings on Denton Island some of us at least seem to have branched out around the world. I live in Poland with my Polish wife and work for a German firm. All the best to all old friends and colleagues. Hi Richard (Welfare), thank you for your kind words about Dad (Reg Laycock) I passed them onto him and he sent his best wishes to you and your Mum. Sadly he passed away 31st July - sad days. I remember your Dad John very well, also seem to remember his sister Daphne was our neighbour in Lee Way for many years. I too have Dad's reel to reel - built to last!!! Hi Christina Mitchell... I'm so sorry to hear about Reg passing... mum and I send you and your mum all our love, thoughts and best wishes. If you want it would be nice to catch up (if you want to), my dads sister is Beryl..... I also have my nans Ferguson record player and yes it still works as you say built to last. I was an apprentice when I left school in 1969. I started work at the factory in the Drove, on the solder bath run controlled by a large lady called Eileen after being there for a couple of months, I was transferred to Denton Island, to work in the metal trim section, glueing all sorts of metal trims to go on the front of the record players, this section was run by Frank and a lady called Carol we used to be given milk to drink as the glue was quite nasty stuff, after working there I was given the job of fault finding, on one of the lines, our chargehand was Keith Pybos a really great bloke he was always keeping us repair boys out of trouble. I wonder what happened to him? We used to come in on a Saturday morning on overtime and would hear lots of stories from Dennis Hedges when he came in latter in the morning. I have lots of fond memories of Thorns and was always in the test gear lab talking to Chris Tidy and a guy called George who I think lived in Seaford. My time at Thorns was short only a couple of years as I left and got a job at a bakery in Woodingdean as an electrician. Living in Newhaven I remember catching the bus to Lewes many times and talking to Paul Blackman who was going out with a girl from Lewes. Correction - it was Chris Hawes (not Hawks). I also see from an earlier entry that the guys in the office were Neville Chapman and Alan Godsmark - brings it all back to me! I wonder if anyone remembers me driving to work in my silver Messerschmitt bubble car? I hope no-one remembers me buillding an entire cassette deck with tacho-gen motor and dolby board, having blagged all the components off the line! I used it for years. Hi Les. Yes I remember you working at Thorns and catching the bus to Lewes together. Just by way of 'catch up' I eneded up marrying the girl from Lewes, we have now been married for 43 years and we still live in Lewes. I am a regular 'reader' and have contributed some items and photos to this site so pleased to have caught up with you. Hi Colin, great to see you hear from you after some 35 plus years. You're right with all the names. When I first posted the photo above I couldn't remember Chris Hawes' name but now you have reminded me, I think you and he came to work in our office at the same time or only a few weeks apart. When you lived in the house in Peacehaven maybe one of the names you can't remember is Malcolm Austen. I think he originally rented to whole house and then 'took you guys in. I vividly remember you coming to work in the Messerschmitt bubble car. How did you ever survive it and also you 'borrowing' the parts from the production line to build your casstte deck ! I am contacting the editor of this site, as has been recommended, to get your email address so hopefully you will send me some of the photos you have. Kind Regards, Paul. Oxley & Bennett used to do much of the maintenance at this factory. However there was a problem. Once a young apprentice was sent there to carry out a minor job in a section where there were only women working. He eventually came back to the yard complaining that "That randy lot had relieved him of his clothes" Thereafter is was difficult to get any young man to go there unescorted. Yes, Trevor, I remember it well !!!!!!. My wife (Maureen) worked on the twilight shift there for a number of years although when she told me of some of the antics I'm surprised anything they completed worked. She can still solder though. Hi Paul, Do you have anymore of the photographs of the giant music centre? I remember posing for a photo with some of the other lads, but I haven't seen that photo in a long long time. One of my jobs at Thorn was to troubleshoot and repair those music centres. I left Thorn in 1979 after 6 years and moved on to other Radio/Electronics companies in the UK, (ITT, Marconi, Multitone and Nokia. Since 2000 I have been living in California USA and I'm still working in the radio industry, my current employer is Skyworks Solutions Inc. We design and manufacture analog semiconductors for use in all kinds of wireless devices. I remember Dave Corver, he was the mentor for the apprentices. Mark Giles and Bob Jenner are names that come to mind. Sorry William but the photo I posted above is the only one I have of the music centre. Good to hear you are well. Does anybody remember Morris Deakin and if he ok and what he is up to. I worked with Maurice at the factory for nearly 24 many years and was best man at his wedding to Kaye. Sadly lost contact with him many years ago so like you I would be interested to know where he is now. If we are talking about the same Maurice Deakin, I heard he was at one time manager of the Ship Hotel at the bottom of the high street. Knew your Dad, John, very well Richard, he was the Production Planner for many years and was always willing to help out if problems arose. Regarding the other comment from William above, yes I did know that Maurice and Kaye were at the Ship Hotel as they went there after living next door, for many years, to my Mum and Dad in Brighton Road, They married around 1969 if I remember correctly and moved into Brighton Road then. From there to the 'Ship'. From there...........who knows. Hi Paul, do you remember me in the drawing office? with Dave Deakon, Dave Newcomb, Alan Howard. I remember doing the Furguson Logo on the big music centre, my daughter was on the float when it came to at Eastbourne! Regards David. Yes of course I remember you. Blue Ford Anglia van comes to mind or is my memory failing me ? We worked to together in the Drawing Office on Denton Island when Alan Howard was Chief Draughtsman. I have never seen Dave Deakin since we all went our separate ways but you may be aware that Dave Newcombe passed away a few years ago. I see Alan Howard from time to time around Lewes where I still live. Hope you're well Dave. Good to hear from you. Regarding your enquiry about Reg, Paul and Bob......Reg I assume is Reg Laycock who I believed moved to Essex but not sure, Paul is Paul Davis, sadly he passed away earlier this year and Bob you refer to is Bob Inman who I remember lived in Peacehaven but I have had no contact with since we all left the factory on the island in 1989. Gorden is Gordon Martin who went to work with Mark Giles for some while but again I know he is not working there now. I only saw Mark last week so I will enquire about Reg, Bob and Gorden to see where they all are now. Yes Reg Laycock did move to Essex where I believe he sadly passed away, that is such bad news to here that Paul Davis has passed away this year, as for Bob Inman I last heard he was living in Hellingly near Hailsham............ it must be about 7 years since I last saw Paul how time flies....... that's it Gorden Martin last I knew he was living in Denton..................... have you heard anymore about Maurice ? I worked in the test gear lab from about 72 to 74 (can't remember exactly) with Dave Hunt, Chris Tidy, Alan Millar and George White. Chris sadly passed away about 20 years ago. I have lived near Gloucester since I left Thorns. I still see George White occasionally. I remember most of the names that have been mentioned. I loved my time there. I nearly went back to work for Dave a few years after I left, but decided to stay in Gloucester. We used to have great evenings out with the bunch of students working at Thorns. Does anyone remember Sue Parkinson? I was great friends with her and Dave, her husband. Sadly lost touch about 25 years ago. Hi Martin, I remember you and your Mini Marcos springs to mind. Spoke to George White about 12 years ago. He was still living in Seaford. Also made contact with Tony Gray. Very sad to hear about Chris Tidy. Yes the green mini Marcos was mine. I bought it from someone at Thorn, but I can't remember who. I think he worked in the drawing office. I remember your your name but can't remember where you worked, sorry. Were you in the test lab? Martin......I remember very well the Mini Marcos because the guy who built it was a student studying Mechanical Engineering and worked alongside myself in the Engineering Department. His name was Tim Leaton and he lived in Herstmonceux at the time. I worked with many of these guys as an apprentice. Dave Corver and so many of these people made me who I became, a gratitude I have never paid them. I now own and run ONIX GB and started ONIX AUDIO along with Tony Brady in the 80s. I have travelled and have had a great life .. Thorn EMI is the reason I went in my chosen Direction. "Not the normal humdrum life". Its the reason I can design from nothing my product range, it is the reason I created a company and made its systems efficient. There were some great people at Thorns that shaped so many, sadly many won't ever have understood why. I thank ALL of the people there that created who I am good or bad they all left a mark. The UK left manufacturing behind. J2t was the end of Thorn EMI for us. All these people were characters and we all complained every day about so many things. Were were however united in our plight. I worked at the factory from 1968, mostly on production but also in the test lab with Chris Tidy and Dave Hunt. I was transferred to the Bexhill site and became the site engineer and safety manager until I left in 1978 to work at Bright College. I remember many of the people at the factory including George White, Mike Kerr and Joe Blackman. The large music centre was used in the Bexhill Carnival I recall with many of the young girls dressed as nursery characters. Retired now but still living in Sussex.